Twitter is becoming more integrated into the physical world and the latest example, Red Funnel's tweeting ferries, is a great demonstration of how social media can actually provide real consumer benefits. Red Funnel customers commuting between the Isle Of Wight and Southampton can now get 24 / 7 real time updates about the Red Funnel ferry service - either through a Google Map that shows boat locations on the Red Funnel website or by following @redjets / @red_ferries on Twitter. 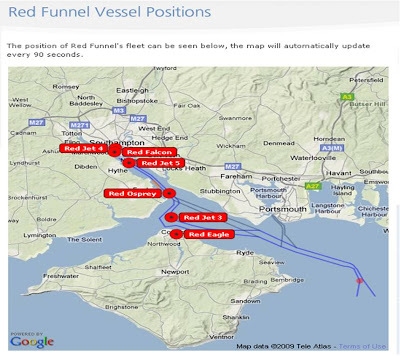 Designed by IBM inventor (and Isle of Wight resident) Dr. Andy Stanford-Clark, on board sensors are linked to IBM data analysis computers and boat location data is then sent to the Red Funnel website every 90 seconds. Departures and arrivals are broadcast to customers through the Red Funnel Twitter accounts. This is more than just an interesting way of laying a visualisation onto real world data or a Twitter gimmick. The tweeting ferries help Red Funnel customers by giving early warning of delays or problems and help to make the journey as easy as possible - another example of how Twitter is more than just letting people know what you had for breakfast!